Steve Masat, who joined the board in 2014, is a fourth-generation farmer on a first-generation farm southeast of Redfield. As a high school student, he started farming with his father, Roger. Then, he rented a neighbor’s farmland for three years before buying nearby land in 1983 and adding more quarters over the years. Today, he raises corn, soybeans, alfalfa and grass hay, and also has a permitted feed yard. He owns 1,600 head of cattle and runs a cow-calf operation with about 125 pairs. Masat brings a cattle producer’s perspective to the board and would like to see state and county officials work together on agricultural permitting processes to allow family farms to expand their livestock and poultry operations. Those expansions would result in use of more grain and byproducts in-state and would enhance economic development, he said. A thriving ethanol industry is good for livestock producers because it provides distillers grain for feed. 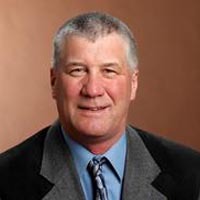 Masat is a delegate for the Wheat Growers cooperative and served 16 years on the South Dakota Wheat Inc. board, including terms as president and vice president. He serves on the Hitchcock-Tulare school board and has been a Crandon Township clerk for 25 years. He served on the Farm Bureau state board, is a member of the South Dakota FFA Alumni Association, and has been a 4-H leader for 15 years. He and his wife, Caroline, have three children: Tim and his wife, Vianne; Garrett; and Ashley.